Here it is at last, the final installment of the Shifters of Wolfsbane series! You don’t have to have read the other books to enjoy this one, but there are some special surprises for you if you have. When Frost meets Fire, someone might get burned. All that Seraphina Blackwood has is a cat made of flame and proof that her sister Arabella is still alive. Though she refuses to use her fiery talents to harm anyone, like her captors want, she will use them to escape. While being pursued, she runs into Easton Frost, a handsome shifter whose golden eyes make her forget herself. Together, they must find Arabella before her foes do. But Seraphina’s enemies are cunning, and they will force her to make a terrible choice. If she can’t find her fire, she will face a dreadful fate. Now available in a complete box set! When Lia’s magic fails her at the worst possible moment, she’s banished from her coven. She runs into the woods, only to discover that two wolves are hunting her. She can’t escape, but when the wolves shift into bare, handsome men, escaping no longer seems quite so important. This is a complete story—no cliffhangers! Get ready for wolf shifters, steamy ménage romance, and a very HEA. All parts of Fated for the Alphas are on Amazon for just 99 cents, or free with Kindle Unlimited. Or get the Complete Collection! Secret Legends… Do you dare? Secret Legends is here! This collection contains 20 exclusive stories of Paranormal Romance from New York Times and USA Today bestselling authors, and includes my story Alpha’s Keeper. One-click now and let the authors of Secret Legends take you on 20 unforgettable adventures. This collection is priced at 99¢, but this crazy deal is about to disappear. Don’t miss out! Get this book (and 19 others) in Secret Legends! Time is running out to get Myths & Magic for just 99¢! Buy this collection now to read my brand new and exclusive story, Bound to the Alphas, and 20 other incredible tales. If you’re ready for 21 exclusive full-length novels and novellas, including some BRAND NEW material, in a boxed set where vampires, shifters, ghosts, demons, and even Djinn haunt the pages, then fall into MYTHS & MAGIC, a collection of science fiction, fantasy, and a dash of paranormal romance that will take you to the edge of your imagination. Order today for just 99 cents! Read Bound to the Alphas now, only in Myths & Magic! Secret Legends is finally available for pre-order everywhere! This collection contains 20 exclusive stories of Paranormal Romance from New York Times and USA Today bestselling authors, and includes my story Alpha’s Keeper. Order today for only 99 cents! Haunted by Magic is here… grab it to read my story, Alpha’s Thief! 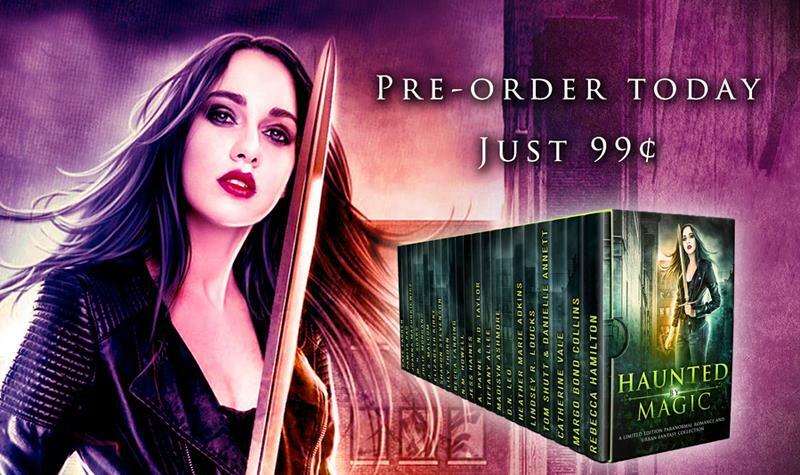 Prepare to unleash 22 haunting Urban Fantasy and Paranormal Romance adventures with the Haunted by Magic omnibus! Order Today to find out how these magical stories will haunt your dreams and keep you glued to your reading tablet well into the witching hour. Will fate bring love or ruin? June Yates spends her days mopping and scrubbing her aunt’s inn with only a rat for company. All she wants is one of her late mother’s possessions, but her aunt keeps it locked away with a magic key. June resigns herself to her chores, like serving the handsome new guest with the golden eyes. After his father’s knife is stolen by a dishonest innkeeper, Dominic Frost vows to retrieve it no matter the cost. He falters when he finds himself drawn to the inn’s servant, who his wolf insists is their mate. But reclaiming the knife is more important than one human—isn’t it? When Dom makes a shocking discovery, he and June must both decide what to fight for. Their choices will determine whether they’re fated for love or ruin. This is a standalone novella with a guaranteed HEA. Stealing’s easy for a thief who can stop time. Love is harder—and more dangerous. Sold and chained, Arabella Blackwood is forced to steal for her masters. Since she can stop time, the work isn’t too hard. Escape will be more difficult, and outrunning her captors may be impossible when one of them can scent her trail. Time actually stands still when Ryder Frost first sees his fated mate. Despite her thieving habits, he feels the need to protect her. But she’s terrified of shifters, and with a full moon approaching, he’s not sure how much longer he can conceal his true nature. Halloween’s almost here, so have some treats! Parts One & Two of Fated for the Alphas are FREE today through Halloween. Happy reading!